Welcome to A Sampling Bee! Today, I share with you Low Kalz Subscription Box! This is a brand new subscription box that sends you healthy, low calorie snacks and beverages. Each month, Low Kalz will surprise you with something new to try. Whether its a new drink or a new snack. Examples include 110 calorie mini pretzels or 0 calorie American Water Sparkling Water. You can select to receive a box of full of either 5, 10, 15, or 25 snacks that are both yummy and low-calorie. Healthy and low-calorie drinks will be included. Low Kalz subscription Boxes are sent out on the 1st of each month. 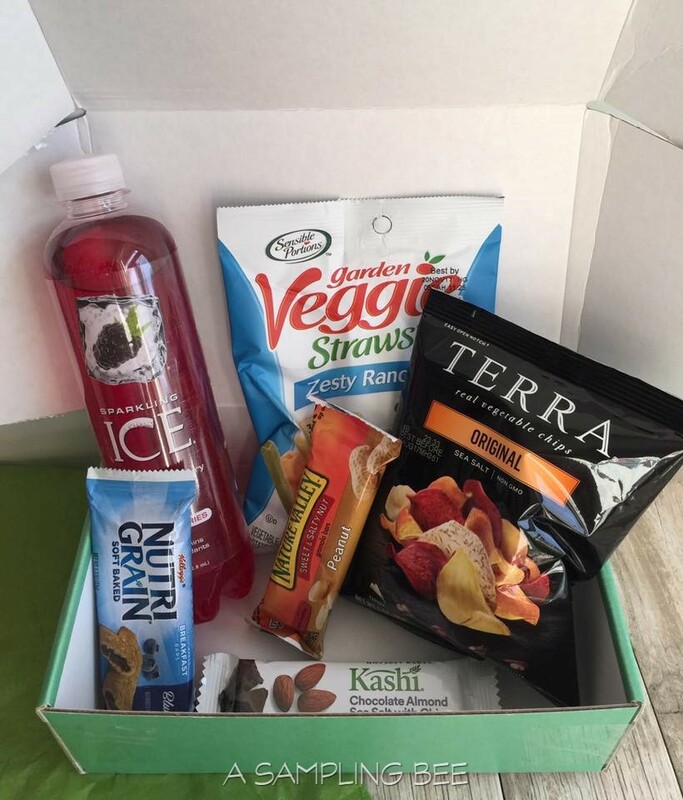 Get yummy snacks delivered to your door every month. Prices start at only $12.95! So.. What was inside my Low Kalz box??.. Terra Real Vegetable Chips Original contains veggies such as sweet potato, parsnip and taro. These chips are non-GMO and flavored with a hint of sea salt. The one ounce bag is only 150 calories! Sensible Portions Garden Veggie Straws Zesty Ranch contain 30% less fat than regular potato chips. These veggies straws contain no artificial flavors, colors or preservatives. The one ounce bag is only 130 calories! Kashi Chocolate Almond Sea Salt w/Chia Granola Bar is full of yummy granola and chocolate. One bar is only 140 calories. Nature Valley Sweet & Salty Peanut Granola Bar is only 170 calories! A great snack for on-the-go. Kellogg's Nutri Grain Soft Baked Blueberry Breakfast Bars are great for well, breakfast! At only 120 calories. Enjoy this bar with a hot cup of coffee! Sparkling Ice Black Raspberry Sparkling Water is full of vitamins and antioxidants. A drink that is zero calories! 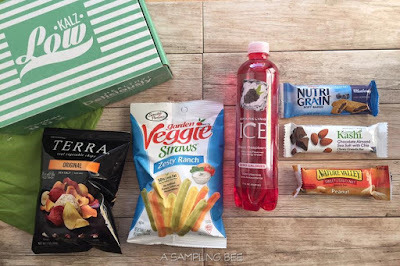 LOTS of yummy goodies in my Low Kalz box! I really enjoyed the Terra Chips and the Sparkling Water. I like this idea of a low calorie snack box because I can feel less guilty about snacking. I can grab a snack as I am walking out the door and know that I didn't grab something unhealthy. I like this idea also because my family gets to try new snacks before having to buy them. I'd rather get a sample rather than buy a whole box only to not like what I bought. It was my first time trying all of the products in this box. And they were all really good! I highly recommend! I received a Low Kalz box to review. All opinions are my own. Always!